One of the many big surprises at WWDC this year was the news that iOS 8 and Mac OS X 10.10 would support app extensions, which give developers a variety of new ways in which data and services can be shared between apps. One of these new types of extension, called a Share extension, essentially allows apps that generate user data provide content to apps that publish user data. As a developer whose main app, MarsEdit, is a blog-publishing tool for the Mac, you can imagine how this might be of interest to me. The first thing I noticed upon digging into app extension development is that it’s fairly fiddly to get set up, and the default build, run, invoke iteration loop is fraught with administrative overhead. This will get old fast, and 99% of the time what you’ll want to run is exactly the same dang app you just ran. 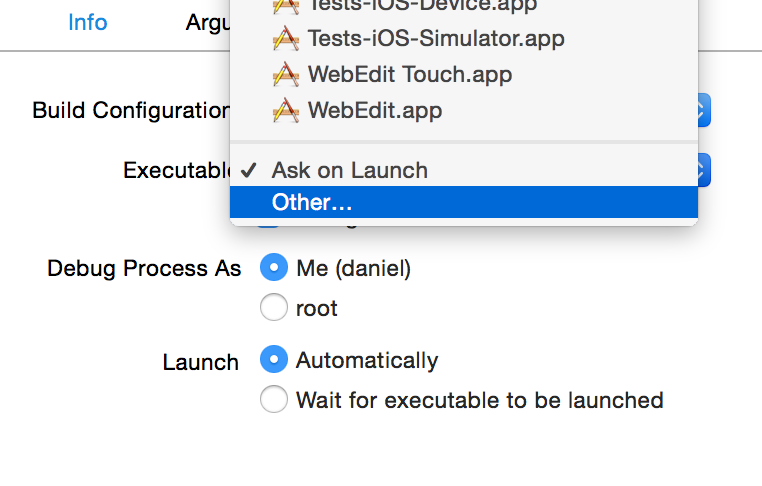 Luckily, this is easily addressed in the scheme settings, where you can change the “Executable” selection in the “Info” section of the “Run” tab from “Ask on Launch” to a specific application of your choosing. That’s all well and good, but you still have to go through the tedious task of selecting some suitable content in the target app, clicking the share button, and choosing your extension from the list, before you even have the luxury of examining your own code’s behavior. Wouldn’t it be great if you could make changes to your app extension’s appearance or behavior, click Run, and moments later be looking at your Share extension’s UI without having to do anything else? Good news: you can, and I’m about to explain how to achieve it for both Mac and iOS targets. The only way I know to guarantee this is to write your own code that invokes the extension, and put it in a custom debugging-purposed target, or else put it into your main app as conditional code that only runs when building Debug variants and when prompted to take effect. I can imagine a sophisticated version of this approach involving a multi-faceted extension-debugging target that would be capable of fast-tracking extension invocation for a variety of data formats. But for the simplest solution, I recommend adding the ability to invoke your extension to the very app that hosts it. Then your simple test mode behavior will always coexist in the same source base as your extension code. The #if DEBUG just ensures that I will never inadvertenly ship this code in a release version of my app. The environment variable ensures I won’t be plagued by my extension’s UI appearing whenever I’m working on other aspects of my app besides the extension. Now we just have to dig into the specifics of how to “RUN MY EXTENSION.” I’ll show you how that works for both Mac and iOS based Share extensions. You can see the basic gist of it is similar to the Mac, but you have to configure the view controller directly as opposed to providing a list of arbitrary input values. Also bear in mind that because the iOS-based solution above relies upon [self navigationController] being non-nil, you’ll need to add the special debugging code at a point in your app’s launch process when this is already set up, or else find another way of ensuring you can meaningfully present view controllers to your app’s main window. Notice that I hinge all the invocation on simply whether the RSDebugAppExtension environment variable is non-nil. Basically while I’m debugging I have to go in and change the code in applicationDidFinishLaunching to invoke the extension in the way I want. This works OK for me at least at this stage, but I can imagine down the road wanting to be able to fine-tune the behavior of how the extension is invoked. For this purpose, why not encode into the value of the environment variable itself certain clues about how to invoke the extension? It could specify for example what text should be passed the extension, or other configuration as desired. My intent in sharing this blog post is both to point out some potentially time-saving tricks that will help those of you developing Share app extensions, but also to encourage you to look for creative ways to cut out the tedious aspects of whatever you work on. When all is said and done, the few monotonous steps during each iteration of work on a Share extension probably don’t add up to all that much in sheer time, but they take a lot of the joy and immediacy out of development, which frankly puts me in a bad mood. Clicking Run and seeing my work, including my latest changes, pop up instantly on the screen makes me feel a lot happier about my job. I am pretty diligent about following up on crash reports, probably because when it comes down to it, chasing crashes is one of the funner aspects of software development to me. Sure, when I’m hours into a frustrating problem and can’t make heads or tails of why something’s blowing up, it’s exhausting, and I wish to hell I could simply find the solution, but upon finally unwinding the riddle of a failure, it’s all those hours of toil that pay back dividends as the thrill of success. I love it when customers take the time to write something about the circumstances surrounding a crash. Often even a little clue can be enough to lead to the unique series of steps that will ultimately reproduce the problem. In this case though, I was confused. I know OneDrive is Microsoft’s cloud storage solution, but is the customer uploading a PDF from their mounted OneDrive, or … ? Luckily the customer in this case also left an email address, so I got in touch and, after a few rounds of zeroing in on the meaning of the expression “embedded from OneDrive,” I learned that the issue was specifically to do with pasted HTML source code that Microsoft offers to customers who wish to literally embed a OneDrive document into another web page. So I created a OneDrive account, added a PDF document to my storage, copied the “embed code” for the item, and pasted it into a new MarsEdit post. To my great surprise and satisfaction, when I pressed Send and published the post to my blog, MarsEdit crashed with exactly the same stack trace as the customer had submitted. Usually, when you see something like this where a thread is crashing while trying to release an object, the first thing to suspect is that you’ve screwed something up. Probably by over-releasing some object or neglecting to nil-out a delegate attribute when one of your objects is destroyed. But in the case of logs like this where the crash occurs with a backtrace that is separate from your own code’s control (it’s a run loop callback to Apple’s own networking code), it can be hard to trace it back to specific code in your app. In this case, I can tell by the NSURL clues that a network request is probably being serviced, but which one? And which object was its delegate? Luckily, the clue about OneDrive had led me to a working test case, so I could dig into this question with more care. The first step I like to take is to hopefully separate the crashing issue from my own app’s code, by creating a stripped-down test app that exhibits the problem. If I couldn’t achieve that, then the bug probably did rest somewhere in MarsEdit, and if I could create such a test case, then the problem of poking at it to deduce what is going wrong is made much simpler. I created a new document based application whose document windows possess a single WebView. When a new document is created, the document does one thing: load one of those OneDrive embedded documents as the HTML content of the view. Armed with this test app, I was able to create new WebView instanced with the presumably problematic HTML code, and observe the behavior of each WebView in isolation from other junk that might have been going on in a more complex app such as MarsEdit. The only problem was that my test app didn’t seem to exhibit any problems. I could load 10, 20 WebViews with the OneDrive embed code in it, and they all ran like butter. Damn it, there was no bug here! Until, that is, I deigned to close one of those windows. Blam! The test app crashes, yielding an identical stack trace to the one provided by my customer and reproduced in MarsEdit. It started to make sense: when you publish a post from MarsEdit, the default setting is to also then close the window associated with that post. The reason the customer experienced the crash after sending the post to their blog was only because that happened to correlate with MarsEdit subsequently closing the window, and thus destroying the WebView that had held the OneDrive embed content. Ah ha! So the object in question, the one being delegated to by NSURLConnection, is probably the instance of the WebView itself. But, I don’t set a WebView as a delegate of any NSURLConnection, and certainly this simplified test case doesn’t. So it must be WebKit itself that is setting itself as an NSURLConnection’s delegate. Not my problem, I can file the bug and move on … or can I? Since I knew that the issue at its core appeared to be the over-release of an object, specifically of the WebView, I moved up from the basic utility of zombie objects to the high-octane “Zombies” flavored analysis configuration of Apple’s Instruments tool. Like the runtime flag we set earlier in Xcode, this makes it easy to detect attempts to message zombie objects, but it also goes a step further by correlating that knowledge with a recorded history of a given object, and all the memory-management related manipulations of that object. The tail end of a very long table shows the running retain count for an object, in this case the WebView itself, as well information about which library, method, or function was responsible for the call that affected the object’s memory management status. By the time an object’s dealloc method is done running, the object is gone. I mean, literally gone, or else being managed as a zombie object for debugging purposes. An object can be retained and released as much as you like, but if you’re already in the midst of dealloc’ing the object, it won’t make a bit of difference. Autoreleasing an object postpones release until a later time, when the active autorelease pool is released. Sending the request would be fine, except for WebView’s own conscientious behavior which takes care to retain and autorelease itself whenever a new batch of network requests is made on its behalf. This guarantees that the WebView won’t disappear while an open request is running. But of course, it can’t make that guarantee when the WebView is in the process of being destroyed. Short story shorter: WebView inadvertently adds itself to the autorelease pool when it’s on the verge of being destroyed, and subsequent release of that autorelease pool causes a zombie message to be sent to the deallocated instance. I reported the bug, and submitted a patch to the WebKit team. My proposed fix works around the problem by wrapping the bulk of WebView’s -dealloc method with a separate autorelease pool, such that any inadvertent autoreleasing of the WebView will be tidied up before the object is literally destroyed. Because WebKit is open source, I was able to make the change, build and test it, and confirm that the crashes disappear both in my test app and in MarsEdit. I would like to thank Alexey Proskuryakov for taking the time to help dig into the issue in parallel with me. He was on to the nut of the problem long before I was, but I glossed over some key hints in his analysis. He also helped in guiding me through the steps of submitting a proper patch with my bug report. Hopefully Apple will accept my patch, or come up with a smarter way of fixing the problem for a future update to WebKit. In the mean time, I want my app to be as reliable as possible for the widest variety of users as possible. Yes, that even means Microsoft OneDrive users. How can I work around the problem today? The simplest solution, requiring neither subclassing of WebView, swizzling, or anything like that, is simply to take care before releasing a WebView in your app, to manually call -[WebView close] on it first. This takes care of all the complicated business that runs the risk of autoreleasing the WebView, such that when WebView’s own dealloc method is reached, it won’t have any such complexities to expose itself to. Tracking down and fixing this bug has been an incredibly tiresome yet rewarding experience. I hope you have learned a thing or two from the approach I took here, and that I have inspired you to take crash reports with the seriousness they deserve. Your customers will thank you for it, and you might even get a kick out of occasionally coming out on top!